Michael and I went with the intention of learning as much as possible about our shared work from the perspective that they see daily in the field. Our days started with a team meeting that included a devotional, prayer, and detailed planning review to ensure that all schedules and responsibilities were clearly allocated. During the days the staff at Mariatu’s Hope provided us with a guided tour of projects in every stage of implementation, from creative teaching methods in sanitation and hygiene, to the drilling a new well, to tested innovative methods for rehabilitating a well that goes dry seasonally, to routine monitoring and evaluation visits. Robert, the director of Mariatu’s Hope, handed over the controls to the mud drill so that Michael and I could take part in drilling one of The Water Project wells with his team in Kolia village. Upon arrival we were met by the community who had gathered to participate in the hygiene and sanitation training, to contribute labor and resources to the implementation of the project, and to watch in anticipation of clean water access from a central point in the community marked previously only by dirt and dust. 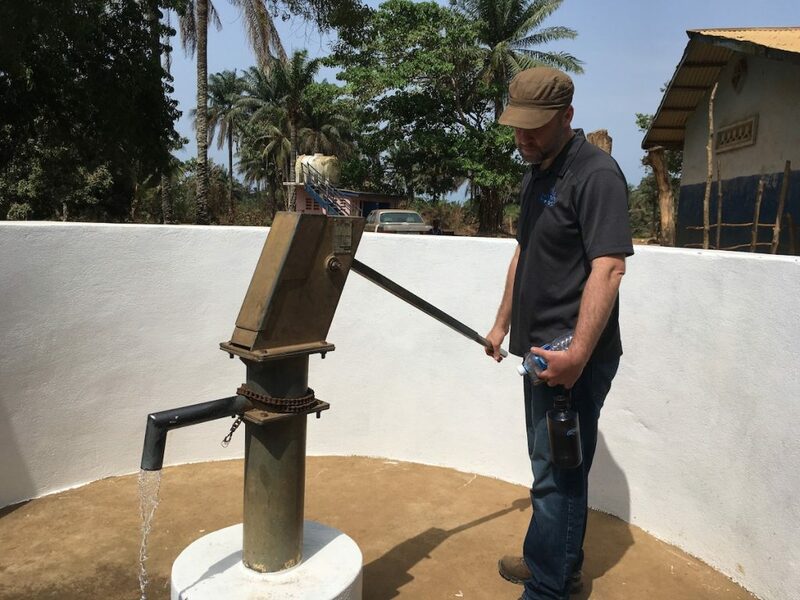 Not long after our return, we heard the good news that both the water quality and yield of this newly drilled well met the high standards of our organizational partnership. In order to reach another site scheduled for a well rehabilitation in Lokomasama we took a circuitous route because there was only one remaining bridge that provided access across the river. The platform of this last standing bridge had eroded and what remained was a series of planks about two tire-widths wide lined up over the iron skeleton. Between and beside the planks one could look down through the beams of the bridge to see the water rushing about twenty feet below. When we reached the bridge we waited in line as pedestrians slowly walked on the planks and motorcyclists walked their bikes along a solid iron line. This commitment to reach communities cut off by infrastructure problems is what our implementing partner has been doing day-in and day-out in Sierra Leone for years. Whether facing issues of dilapidated roads, bridges, unreliable internet access, or inconsistent electricity, Mariatu’s Hope leadership and staff continue to seek solutions and find a way to get the job done. Perhaps the highlight of our trip was a celebration meal that we shared with the staff. In 2017 this sedulous team achieved 100% functionality of every water point we are monitoring. This is an absolutely incredible accomplishment for an organization that works exclusively with water pumps that break down regularly without diligent care, maintenance, and repair. We ate groundnut soup and fish and chicken cooked in the local favorite spicy potato leaf sauce, all poured over steamed rice, and we listened to music blaring through the loudspeakers. The team was excited about the accomplishment, and they knew how to celebrate. Our commitment to on-site visits and our time spent touring the work, conversing about challenges, and celebrating victories is a crucial tool at the heart of what we carefully call partnership. Contextual solutions for the water crisis that plagues our world require ever-expanding networks of partners who are passionate about ensuring that every person within a given area has access to clean water as well as training in sustainable sanitation and hygiene practices. 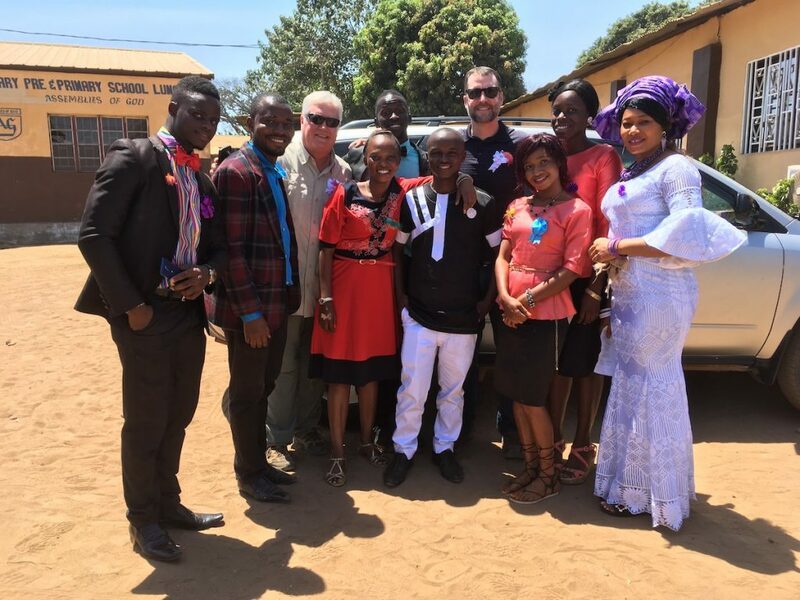 Trips such as this one open space for partners from the United States and Sierra Leone to imagine possibilities and solutions for specific issues that present health challenges to people in daily life. Come to the table and share in the fruit, the laughter, the imagination, and of course, a glass of clean water.